Atlanta Day Trip - - Page 198. Atlanta Day Trip · · PAGE 198. December 23, 2005: After lunch at KLZU and the Atlanta ARTCC visit, the short days of winter were dictating my schedule. Dave Homan and Scott Shaw took us back to Tara Field to get us started on our ride home. Edward took this shot of Dave and I standing by the airplane. I don't remember why Scott did not get in the picture. The departure from Tara Field was a hoot when I started to annouce the wrong airport in my first radio transmission while taking the active runway. I spoke with Dave this morning on the phone and he got a laugh out of my "where are we" comment to Edward when I was making that erroneous transmission. Dave and Scott had been listening on his scanner as we flew out of the airport and headed over to Falcon Field to drop of Edward at his car for his short ride home for the day. They could also hear us just a few minutes later as we flew over Falcon Field and entered the pattern to land. Dave also thanked me again for letting him share in my travels via this web site. He made the comment that I must have worked on this web site more than the number of hours I worked on the airplane. I assured him that was not the case. The ground stop back at Falcon Field was very short since I had a race with the sun to get back to Folks Field before sunset around 5:34 PM. I said goodbye to my son and took off immediately. This photo taken just a few minutes after departure from KFFC is a wide shot taken from about 3,000 feet MSL looking to the northeast up along interstate highway 85 toward the Atlanta International Airport. The ground elevation in this area varies from around 900 to 1,000 feet MSL. After checking the photo above on my camera viewer, I zoomed the lens out a bit to get a closer view of the airport in this next photo. That light-colored patch in the distance below the haze is the Atlanta Airport. Two major power company transmission line right-of-way paths make a large "X" in the trees with Interstate 85 shown just beyond as a gray ribbon angling up toward the Atlanta Airport. This panel shot was taken immediately after the photo above to show my flight conditions under the 3,500 MSL floor of the ATL Class B airspace. 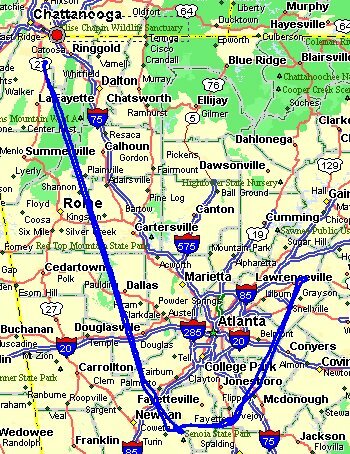 The GPS is coupled to the wing leveler to keep me on course as we pass to the west of the Atlanta airport. At this speed and low altitude, I am not keeping enough pressure on the rudder to keep the ball centered. The RV-9A has an offset vertical stabilizer which requires almost no rudder input during a climb or at high altitudes where I usually fly on longer cross-country flights. This power plant is several miles west of the town of Cartersville, Georgia on the banks of the Etowah River. It is about four miles west of the Cartersville Airport (KVPC). I am out from under the Atlanta Class B airspace at this point and I have climbed to 4,500 MSL to get into the smooth air that covered the whole area today. At this point on the ride home I began to monitor Chattanooga Approach on 125.1 MHz. A Piper twin was practicing his instrument approaches up there and then headed for Rome, Georgia (KRMG) to shoot an approach before returning to his home airport at Kennesaw (KRYY). I was beginning my descent and passing through 4,000 feet when I heard the controller clear the Piper twin to 4,000 also. I was crossing the ridge line and into my valley and had come down to 3,500 feet when I spotted the Piper twin. I had my stobes on and the landing lights to be sure he would see me as I passed below him. When I wagged the wings, he made a clearing turn to the right to give himself extra room. I don't think he realized how much lower I was below his altitude. We probably passed within a half mile of each other with that 500-foot vertical separation as an extra buffer. It was about 5:10 PM when I set up for landing back at Folks Field. When I got the airplane down to 90 MPH, the GPS was indicating 106 MPH and I knew the approach would be from the north end of the field. I flew over the field to confirm the wind sock was standing out from the south wind. When I lined up over the TVA power lines, I could see two people standing at the edge of the runway near the houses in the "extended threshold" area between the power line at Red Belt Road and the touch-down zone in front of the hangars. My landing was a greaser and the south wind kept my stopping point near the wind sock at mid-field. By the time I taxied back to the hangar, the people were gone. I turned off the engine at 5:15 PM, giving me about 19 minutes before sunset at 5:34 PM. The time stamp on this ramp photo is 5:18 PM. Here is the map of the flight today. The flight path covers about 380 statute miles. You can tell by the relatively straight lines where I let the GPS guide the autopilot on the longer legs of the flight. The weather was not bad with some mild turbulence at the boundary layer around 3,000 feet MSL. A good day of flying beats any other day, hands down! The total time added to the Hobbs meter was 3.1 hours including ground operations at four different airports. Until the next flight, I will keep you posted on the other parts of my flying life and guiding Wendell in his RV-8 building project. CLICK HERE for PAGE 199. Return to MAIN MENU.